Drs. 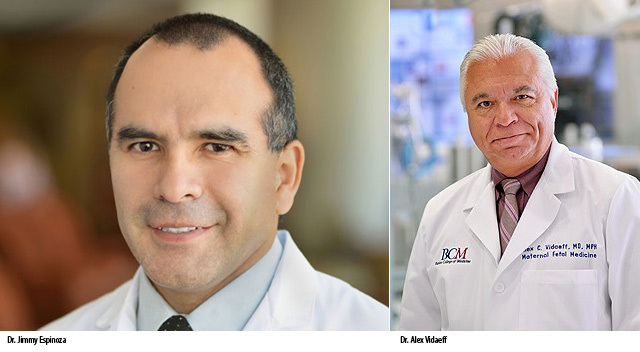 Jimmy Espinoza and Alex Vidaeff were recently honored by the American College of Obstetricians and Gynecologist (ACOG) for preparing new guidelines for the management and prevention of complications of pregnancy including preeclampsia and gestational hypertension as well as chronic hypertension during pregnancy. These pregnancy complications are among the leading causes of maternal death in the United States and abroad. The new guidelines on how to manage and prevent these complications were published in Obstetrics and Gynecology the official journal of the ACOG. Turrentine also said the appropriate treatment of hypertensive diseases in pregnancy may be the most important focus of our attempts to improve maternal mortality and morbidity in the United States, and that the new guidelines will focus clinicians on providing the right and the best care based on the latest and soundest available evidence. Espinoza’s clinical interests include the pregnancy complications listed above; in addition, his clinical and research interest include prenatal diagnosis of congenital defects with emphasis of congenital heart defects as well as fetal interventions including laser photocoagulation of placental anastomoses in twin-to-twin transfusion syndrome, fetoscopic tracheal occlusion in cases of severe congenital diaphragmatic hernia and open/fetoscopic repair of spina bifida among other interventions. He is board certified in Obstetrics and Gynecology and serves as co-director of the Fetal Center and in the Division of Fetal Intervention and Therapy at Baylor College of Medicine. Espinoza earned his medical degree at San Fernando Faculty of Medicine, University of San Marcos in Lima, Peru. He completed his residency in Obstetrics and Gynecology at William Beaumont Hospital, Royal Oak, MI. Espinoza earned his Master in Science in Reproductive Health at the University of Cardiff, Wales, where he graduate with distinction, followed by a Diploma in Fetal Medicine under the auspices of the Fetal Medicine Foundation in London, UK. Vidaeff has extensive experience in the management of multiple pregnancies, preterm labor, and preeclampsia. He specializes in the management of medical complications in pregnancy. Vidaeff is board certified in Obstetrics and Gynecology and in Maternal-Fetal Medicine. He completed his residency at Temple University in Philadelphia. He completed his fellowship training in Maternal-Fetal Medicine at The University of Texas Medical School at Houston. Vidaeff also holds a Masters in Public Health from The University of Texas School of Public Health at Houston. He is the chairman of the steering committee of the World Organization Gestosis, international organization for the study of pathophysiology of pregnancy.